High Performance Interviewing is a concise guide to winning in the interviews that can change your life. It is a neatly constructed publication combining the collective wisdom and learning of two senior executives David King and Jim Starkey, both of whom have experienced over twenty years of interviewing and being interviewed. 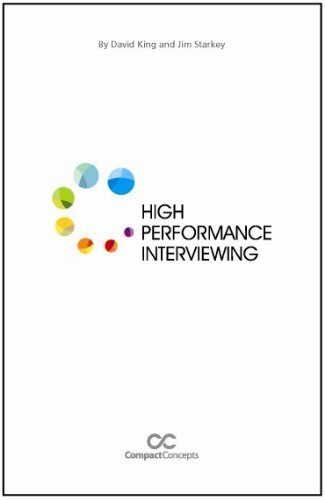 High Performance Interviewing comprises seven key concepts and further divides these into both sub-concepts and actions providing the reader with over 50 ideas to sharpen their interview technique. Unlike other books on the subject HPI does not seek to list multiple questions and suggest answers. Instead it provides an integrated toolbox with which to build the skills that enable you to navigate and capitalize on any interview situation. The seven concepts can be read and assimilated rapidly. Summaries at the end of each chapter are ideal for refreshing your memory. Application of any of the concepts will improve your interview performance. Combining them will give you a step change. Jim Starkey leads the marketing function at OTTO, a North American control-switch manufacturing company. His career spans twenty-five years in engineering and marketing positions at AT&T, Lucent and UTStarcom. He holds a master’s degree in telecommunications from the University of Colorado.